There is "no doubt" people are withholding clues over the murder of a nightclub owner five years ago, police say. 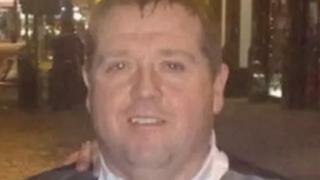 David "Les" Ross, 39, was attacked at the Village Inn Express Hotel in Corby, Northamptonshire, on 17 December 2012. Police said witnesses had "not told everything" about the death of Mr Ross, who was a partner in the town's Rubix nightclub. People who may not have spoken in the past are being urged to come forward. Det Sup Martin Kinchin, of Northamptonshire Police, said: "There may be many reasons why people felt they could not talk openly at the time, but five years on we would appeal to anybody with any information to [come forward]." At the time of his death, Mr Ross was staying at a hotel on The Jamb because his home on Chelveston Drive had been broken into. His inquest in 2015 heard the nightclub owner, who also worked as a taxi driver and door supervisor, suffered injuries to his face, chest and arms, and had probably been rolled "in a foetal position". In 2014 police said they believed Mr Ross had been intimidated by organised criminals intent on taking over his share of the Rubix. Several people were arrested in the inquiry, but no-one was charged. A friend of Mr Ross, Mick Willey, said life still felt "empty, strange" without him five years on. "At the time of his death Corby was a town of about 60,000 people. People must know who's responsible but there's been nothing at all," he said. Police said the murder investigation remained open and detectives continued to visit potential witnesses. Mr Kinchin said: "We have spoken to many people in the course of this investigation, but I have no doubt that there are people who have not told us everything."